We've all been there... Auntie Flo gossping in the corner, your best mates from uni at the bar, the in-laws getting used to the new family and grandad dozing on the sofa. Well if you wonder how to offer them all something special that gets this diverse group of strangers laughing, interacting, chatting together and enjoying themselves, then you've come to the right place. 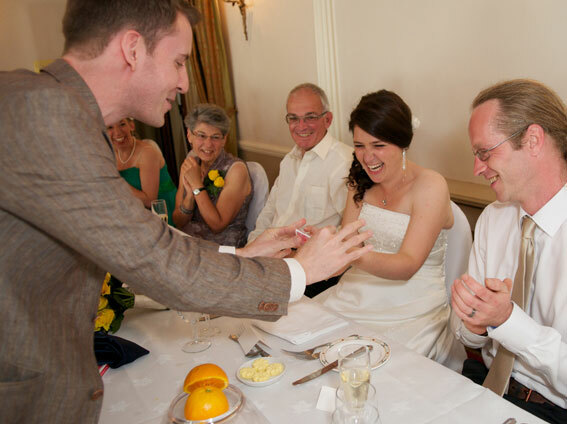 Christopher presents his work as a close-up wedding magician throughout the UK every year and is skilled at not just entertaining your guests, but also mixing with them and helping get a buzz going on your special day. As a close-up magician, he usually recommends magic during reception drinks (while the photos are being taken) and then perhaps around tables between courses. His approach is to work flexibly with the other things you have planned for your special day. In the role of wedding magician, Christopher floats about looking for great opportunities to entertain your friends and family, giving them a magical experience they'll talk about for years to come. 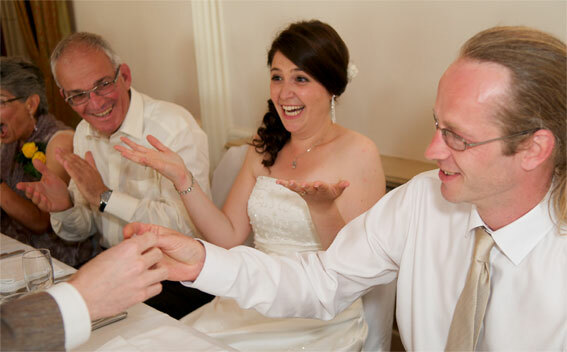 Contact Christopher direct as he's always keen to hear what you're planning for your big day. Then he'll make a few suggestions for you; ideas of how to incorporate his magic and add something special to your wedding day. "Thanks again for a wonderful performance - we met up with friends who were there the next day and they couldn't stop talking about you. We'll be in touch to ask you to come to our daughter's wedding reception to perform - next year." "Thanks Christopher for bringing your magic to our wedding last Saturday. Everyone loved it!!! I still can't get over the last one you did on us...two of spades!! amazing!" "We have heard nothing but wonderful reports about you and your magic, which went a long way to making our special day the success everyone says it was." 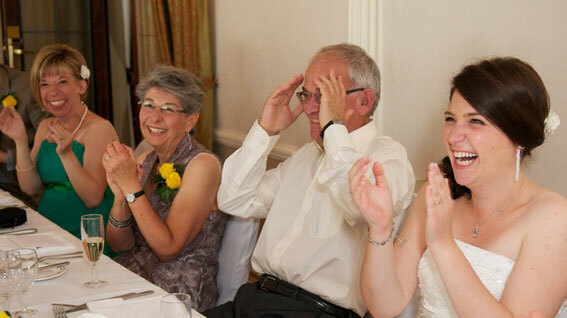 "A huge thank you for making our wedding so very special, you are a fantastic entertainer. We loved the way you mingled with the guests but were also very discreet and professional. Your tricks are amazing and you were enjoyed by all. Initially I wasn't sure whether having a magician could be 'cheesy' but your magic is pure class and very sophisticated. I know that a few brides-to-be at our wedding are very keen to hire you and I would recommend anyone organising a special event to have you perform. Absolutely brilliant - thanks so much Christopher." "We just wanted to thank you for the amazing cabaret magic show at our wedding dinner! Our guests really enjoyed it and I think that now some of us really believe in magic :) Thanks again, it was wonderful!"